The topography and climate of Ridgetop Tennessee have defined its history. Located at the edge of Highland Rim, Ridgetop is more than 800 feet above sea level. In the 1800’s, Sebert Warren and Dave Smiley settled in the area. Smiley was a farmer, a schoolmaster and is believed to have constructed the first house in Ridgetop. One of the town’s most prominent men was Theodore Chancy Woodruff. Woodruff owned a store, served as railroad ticket agent and was the town’s postmaster. Ridgetop, originally known as Nunley and then as Chancy, took its name from the train stop which was known as Ridgetop Station. Construction of the L&N Railroad tunnel began in 1902. The tunnel took four years to complete. In 1905 it was hailed as one of the longest self-supporting tunnels in the world. It was approximately 4700 feet long and 22 1/2 feet high. The advent of the tunnel attracted wealthy Nashville residents to Ridgetop. They came during the summer months to escape the summer heat. The Hiram Percy Maxim Memorial Station (W1AW) is known for its on air Morse code practice sessions and news bulletins. It is open to visitors but for those that are unable to make it to Newington, CT, the ARRL has posted a video tour with Geoff Fox, K1GF, taken on February 12, 2012. For more information, visit the ARRL W1AW page. There was a good turnout for the Storm Spotter Class at Trevecca Nazarene University on Feb. 25. We saw some exhibits and met up with several club members. For those who missed the class, NWS will be holding a SKYWARN Spotter Training class on March 22, 6:00 PM at the Lock Two Park club house. This event is FREE and open to the public. For more information, check the NWS Training Schedule for a list of other training classes in your area. 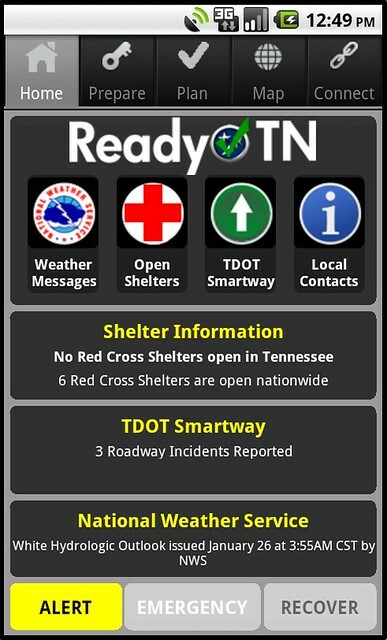 The Tennessee Emergency Management Agency (TEMA) is promoting preparedness for families, individuals and businesses during Tennessee Severe Weather Awareness Week by releasing an Android app called Ready TN. Feb. 19 – Feb. 25 is Tennessee Severe Weather Awareness Week. The National Weather Service (NWS) will use the week to focus on severe weather preparedness, safety and warnings. Specific weather threats such as tornadoes or lightning, along with NOAA Weather Radio and Skywarn storm spotters, will be highlighted on individual days. A statewide tornado drill is also planned and will be initiated with a special NOAA Weather Radio test around 9:30 a.m. CST on Wed., Feb. 22, 2012. Sunday, February 19 – Important Role of SKYWARN Spotters. Monday, February 20 – Hazards of Flooding and Flash Floods. Tuesday, February 21 – Lightning, the Underrated Killer. Wednesday, February 22 – Tornado Safety and Preparedness. Tornado Drill Day. Thursday, February 23 – Severe Thunderstorms and the Devastating Effects of Severe Storms. Friday, February 24 – NOAA Weather Radio and The Emergency Alert System. As mentioned in a previous post, the NWS will be holding a SKYWARN Spotter Training class on March 22, 6:00 PM at the Lock Two Park club house. This event is FREE and open to the public. For more information, check the NWS Training Schedule for a list of other training classes in your area. Bill McCraw, WB7DWJ, took some pictures from the Engineering Day event at the Adventure Science Center on February 18. The club participated by setting up a booth showcasing ham radio capabilities in providing support during an emergency. 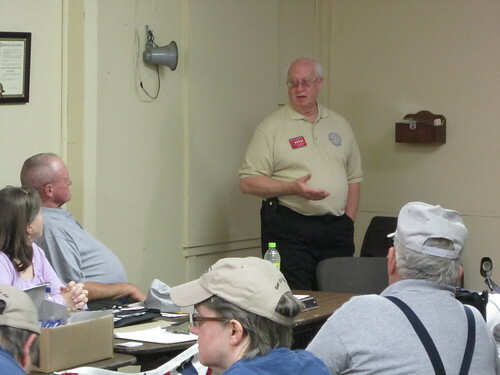 Keith Miller N9DGK, ARRL Section Manager for TN, was a guest speaker at our last club meeting on Feb. 16. He talked about the challenges in setting up his team after being elected as Section Manager. With that complete, he said that he would like to see increased involvement between the amateur radio community and the various counties and emergency agencies. He also invited everyone to contact him with any ideas, comments or suggestions. When you visit ARRL Headquarters in Newington, Connecticut, the first smiling face you’re likely to see is a tour guide. 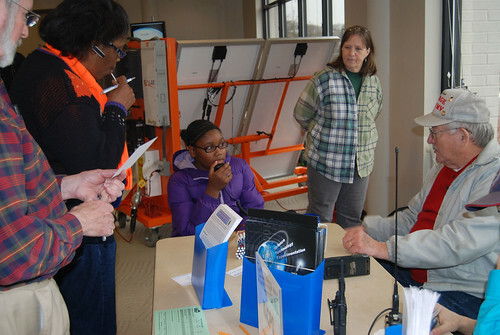 ARRL’s Tour Guide program now includes 19 volunteers who donate thousands of hours of their free time per year, giving tours to hundreds of visitors. ARRL’s tour guides are an integral part of the ARRL. When not giving tours, they are busy accomplishing tasks in various HQ departments — sorting QSL cards, working on special projects in the lab, updating the periodicals archive, and much, much more. The club will have a booth in the Adventure Science Center for their annual Engineering Day event this Saturday, Feb. 18. This event gives visitors the opportunity to learn about different engineering specialties, get involved in hands-on activities, and learn engineering concepts from volunteers. We are going to be a part of this event and show what ham radio can do. For that day, we are looking for volunteers who can be on standby in order to provide a contact for visitors. Club members manning the booth will be calling on the 147.015+ repeater between the hours of 11:00 AM and 4:00 PM.